All of our cameras come equipped with the latest and more advanced features. Besides providing a crystal-clear color picture and a 120° viewing range, this camera comes stocked with night vision so it can be used day or night. If you just need it for backing up, you can have it activate when you put the car in reverse, or you can leave it on for continuous monitoring. The iOS backup camera allows you to bypass monitors in favor of a device that you already own, and there is no additional charge for software or applications. Though the camera was originally designed for hitching a vehicle this has found huge popularity with the wheel chair community. It is very reliable, easy to use and looks fantastic on any tablet. Our iOS CCD backup camera is 100% weatherproof, so feel free to take it out in the rain. This camera can take a hit, so don't worry if you bump it or if a stray pebble dings it. There are no cables or wires to fuss with, so enjoy a simple and fast installation. The controls are extremely intuitive and don’t require you to be a technical expert to get started. This camera is perfect for a car, truck, or SUV. The experts at Tadi Brothers have years of experience in this field. You can count on us to carry only the products that we stand behind 100%. 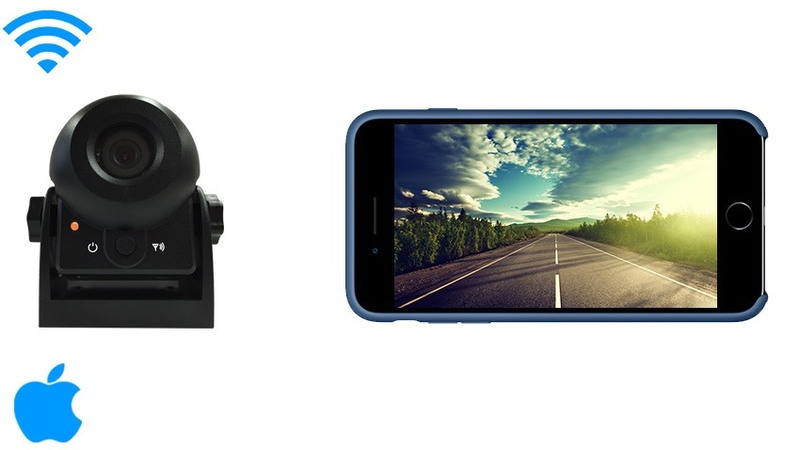 This iPhone backup camera will make your life easier. The fact that you carry the monitor right in your pocket makes it quite convenient. If you have any questions about this product, just call our knowledgeable customer service at (866) 966-5550 ext. 2. Buy with confidence as we have a 30 day guarantee for all of our quality products.Order a backup camera today and eliminate blind spots for good!